Locally, some people may be down on Dave Wannstedt. Luckily for him, other opportunities appear to be presenting themselves for future employment. ESPN's Adam Schefter and Chris Mortensen are reporting that Wannstedt is drawing interest from San Diego, Carolina, Cleveland, and Buffalo for the role of defensive coordinator. If he heads to San Diego, he would be reunited with former Dallas assistant Norv Turner, whom Wanny worked with in the 1991 and 1992 seasons. I would think they would be the leader in the clubhouse to land the ex-Pitt coach at this point. This news should be a surprise to no one; Wannstedt excelled as a coordinator in the NFL and I believe that's where he belongs. His enthusiasm for the game translated well to the college atmosphere, winning recruiting wars and injecting enthusiasm into the program. But the wins just didn't come in bunches large enough to satisfy Pitt fans, and now he's looking for work. A landing spot in sunny San Diego with a promising Chargers team would certainly be a nice rebound for the guy shown the door in not-so-nice fashion here in Pittsburgh, and I hope Dave lands the job. Rooting for Dave. But if any two coaches belong together, it's Dave Wannstedt and Norv Turner. 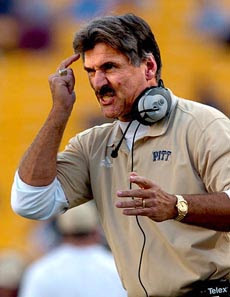 Since Norv Turner dumped his son Scott on Wannstedt to coach the Pitt WR's, turnabout is fair play. My money is on Norv Turner repaying Wannstedt the favor and making him part of the Chargers staff. Nothing like the cronyism in the coaching fraternity.